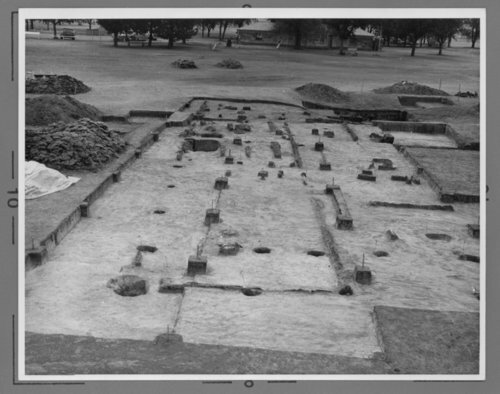 Five photographs showing an archeological dig at Fort Hays, Kansas. Fort Hays was an important U.S. Army post that was active from 1865 until 1889. Originally designated Fort Fletcher (after Governor Thomas C. Fletcher of Missouri), it was located five miles south of present-day Walker and became operational on October 11, 1865. Troops stationed at Fort Fletcher were to protect the stage and freight wagons on the Butterfield Overland Dispatch (BOD) traveling along the Smoky Hill Trail to Denver. Despite the presence of the soldiers, Southern Cheyenne and Southern Arapaho Indians continued to confront traffic along the trail. David Butterfield, owner of the BOD, went bankrupt and the line was abandoned. Since the Smoky Hill Trail was no longer in use, Fort Fletcher was closed May 5, 1866.